The software is self-contained in a single ZIP archive. Whatever folder you unzip the contents into will become your Newbound working directory. The Newbound software is entirely self-contained within that folder, so you can move it later and nothing will break. Also, you can completely uninstall the Newbound software by deleting this directory. For the purposes of this documentation, we will refer to this folder as your "Newbound" folder. All of the dynamically compiled Java classes that the Newbound software generates live in this folder. Deleting the contents of this folder and restarting the Newbound software will force the software to recompile everything. Everything in the Newbound software is designed so that you can use as much or as little of it as you want, so if all you need is a quick and easy web server you can just drop your files in the Newbound/html folder and they will be available at the url "http://localhost:5773/[your file name]". If you want to include third party libraries in your Java code, just toss the .jar file in here and restart the Newbound software. The first time you launch the Newbound software, this folder contains individual ZIP archives and metadata for each library to install. This folder is moved to Newbound/runtime/metabot/libraries after first run. This is the launcher script for Mac OS. The first time you run it you will need to right-click on it to launch. This is the launcher script for Windows. The first time you run it you will need to confirm that you do, in fact, really really want to run it. If a file with this name exists in your Newbound folder, the software will attempt to rebuild itself from the Newbound/libraries folder and then delete the libraries folder and the rebuild file on startup. 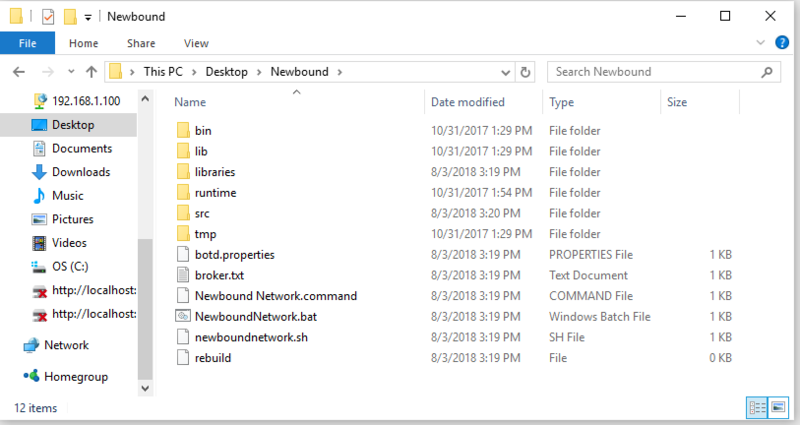 You can force the Newbound software to rebuild itself by copying the Newbound/runtime/metabot/libraries folder to Newbound/libraries, creating a file at Newbound/rebuild, and then restarting the Newbound software. app.properties — Contains the required metadata for this app. botd.properties — Contains app-specific metadata. html — Drop any test html files here, and they will be avalailable at http://localhost:5773/APPNAME/yourfilehere.html. These files will NOT be included with your app when you publish it. You can override files in the Newbound/runtime/APPNAME/src/html/APPNAME folder here. src — Any Java code needed to power your app goes here. There is also a src/html/APPNAME directory and any files you drop in there WILL be included with your app when you publish it. These files are available at the same URL as files dropped in the Newbound/runtime/APPNAME/html directory and will be overridden by them. The Java source code for launching the Newbound software. Includes a Startup class, the compiling classloader, some operating-system-specific classes and the org.json package from Sean Leary. Temporary files get stored here at runtime. If the software is not running and this folder is not empty, feel free to delete it-- it's just taking up space.